How can I install Adobe AIR? I am a heavy user of certain applications that are built on AIR. It appears that AIR has discontinued support for Linux. Even the older versions in the Adobe AIR Archives seem to support only 32 bit Linux distributions and I am on 64 bit currently. Is there even a slight possibility that I could run AIR in these conditions? If so, can you please tell me where can I get a detailed step by step installation for this? Maybe you'll get an error after the last command? Then repeat step 4 & 6 (skip 5, as the permission to execute the file hasn't changed). Install i386 libraries, that are required for successful installation and running of Adobe Air and air applications. Create symlinks to gnome-keyring so Adobe Air could see it. Download Adobe Air installer from here. Give execute permission and then run that .bin file. For Ubuntu 16.04 and greater, install the package libnss-mdns:i386 instead of the package lib32nss-mdns. This will solve the problem of "Package not found error" related to that package. Trying this technique, i get "Package ia32-libs-gtk is not installed"
But that didn't work for either the deb or original binary. Download the 32 bit(yes even for your 64 bit Ubuntu) deb: http://update.devolo.com/linux/apt/pool/main/a/adobeair/adobeair_2.6.0.19170-devolo1_i386.deb (Thanks to yuvilio's answer) The 64 bit package on the same site is a repackaged version of the 32 bit, you will have problems if you use the 64 bit package instead, use the 32 bit package for both 32 and 64 bit systems Ubuntu 13.10+. Alternatively if you have a Steam game that requires Air, simply install and run that game and it will install Air on the first run of the game. I found these during a Weekly Humble Sale to support some open source projects. Step 1: Get some Air Next download the Adobe Air .bin file (direct link here). Open a terminal (applications > Accessories > Terminal) and navigate to your Downloads folder (or the folder in which you saved the .bin file). Installation should zip though and, if everything goes okay, a new menu entry will appear in ‘Applications > Accessories’ titled ‘Adobe Air Application Installer’. ...finally after some trouble and after many searches on this forum, google and others pages have managed to do it. First I want to thank the community that gave me more ambition to do it, than make me quit to install AdobeAir. Whole problem was the package ia32-libs(The ia32-libs package was a hack to get 32-bit packages installed on a 64-bit installation. Since Ubuntu version 11.10 (Oneiric), Multi Arch has been added. One of the objectives for it is removing the ia32-libs package)... package that Canonical has decided to end support for it. 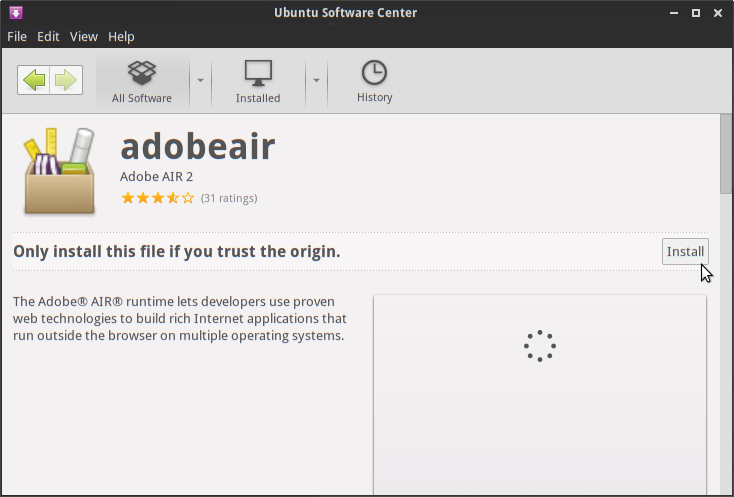 Unfortunately, many years late "Adobe AIR for Linux is no longer supported." following what adobe page says. Using the "AIR archive" is possible to get unsupported versions, the 2.6.0 version is the most recent available. If you need to install a program that require a newer version of it, you might go to Virtual box with a Windows guest. I have Ubuntu 14.04 64-bit. The only way of installing Adobe Air that worked for me was to follow the first part of these instructions for installing Balsamiq on Ubuntu, which is what I was trying to do in the first place. Not the answer you're looking for? Browse other questions tagged software-installation adobe-air or ask your own question. How Can I Install Adobe Air on 12.04 64-bit? How do I install Adobe AIR? Is there some Adobe Air replacement? How to fix a broken Adobe Air package? How can I install Adobe AIR on 18.04? Text editor capable of running complex Regular Expressions? How to make Adobe Air audio work? How do I whitelist Adobe Air applications in the panel?